In late September 2014, Coquitlam staff made a recommendation to council for a street-vending bylaw amendment. Many councillours voiced concern about mobile vending locations, and particularly for putting stress on restaurants and businesses that pay high rent and property taxes. Restaurant complaints was one of Councillor Craig Hodges bigger concerns with mobile vending. But Councilor Terry O’Neill said he had not heard of any complaints from existing businesses during the program. “It’s not a very business friendly thing for a community that’s supposed to be business friendly,” he said. O’Neill doesn’t see street vendor customers as a lost customer for existing business, and instead as a new opportunity in a growing business. 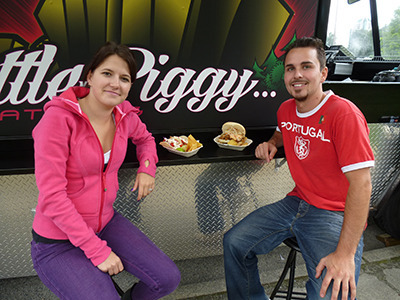 James and Katie Coutu were Coquitlam’s first food truck, but aren’t currently operating in the city (Tri-City News). Coutu said that he feels mobile vending is more of a threat to fast food than to sit-down restaurants. Only one of the four street-vending licences in Coquitlam was renewed this year. 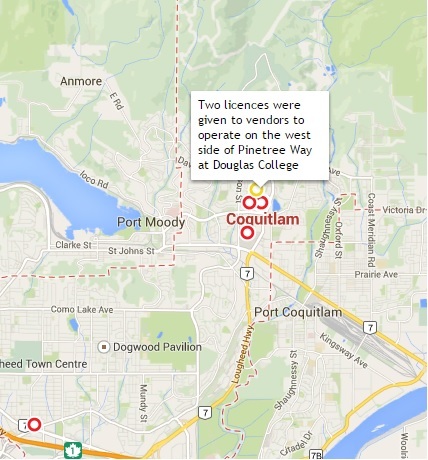 Coutu did not renew his license to operate in Coquitlam. “Increased regulations in Coquitlam and prices for Coquitlam were too expensive in comparison to other places, they’re way higher,” he said. This Little Piggy Catering is currently licensed in Port Moody, and while Coutu said he would like to operate in Coquitlam again, he said it will depend on what regulations are put in place.